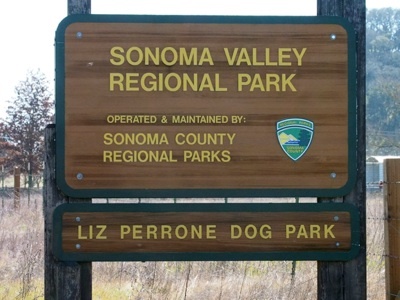 GPS address: While the official address of the park is 13630 Sonoma Hwy., Glen Ellen, CA 95442, using 13875 Sonoma Hwy. should take you to the stores just across from the park entrance. Look for the sign shown at left. GPS Coordinates: The park entrance is at 38.3665N,122.5123W, while the main parking area is at 38.3643N, 122.5122W. Access: Approached from Highway 12 (also known as Sonoma Highway). 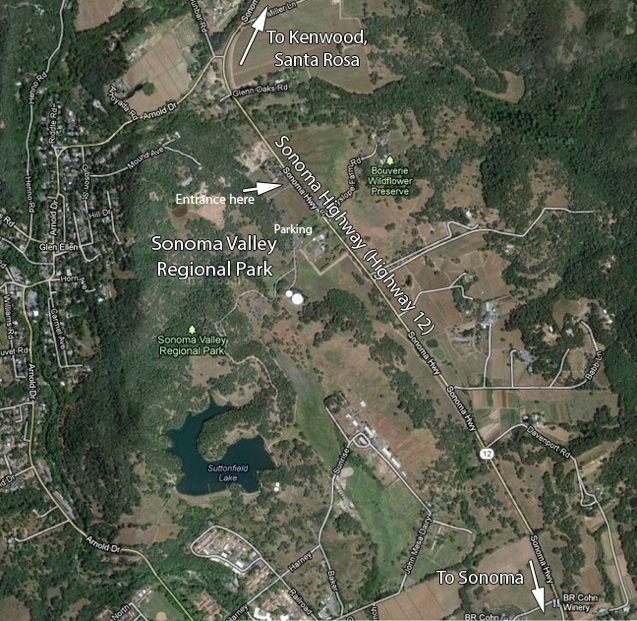 Kenwood and Santa Rosa are to the north and the town of Sonoma is to the south. Parking available. Requires $7 parking fee, but holders of Sonoma County Regional Park annual passes park free (passes were $69 at the time of writing (2013), but see the Regional Parks website for current information). Picnic tables and barbecues near the parking area. Suttonfield Lake (or Lake Suttonfield) is accessible from the park. See notes at the bottom of the page. Restroom facilities: Portable toilets at the parking area. Restaurants nearby: Café Citti, at 9049 Sonoma Highway (Hwy. 12; 833-2690) is probably the closest. It offers excellent salads, pastas, and other Italian food. Otherwise, the town of Sonoma is your best bet in the immediate area. Among the restaurants, I recommend the Plaza Bistro (420 1st East, 996-4466), The Swiss Hotel (18 West Spain St., 938-2884), and La Salette (452-H First St. East, 938-1927) for dinner. Maya Restaurant (101 E. Napa St., 935-3500) is good for South American-style lunch, but there are many other choices as well. Nearby attractions: The small, charming town of Sonoma has numerous shops, galleries, and restaurants. Plaza Bistro hosts excellent jazz nights--not to be missed if you’re a serious jazz fan. Mission Sonoma is at the north end of the town’s central plaza--the northernmost of the Spanish missions. California’s flag first flew in the square here. Otherwise, the Sonoma Valley wine country is at your feet. Wellington Vineyards is close by, at 11600 Dunbar Rd., in Glen Ellen, CA 95442 (939-0708). This is perhaps my favorite Sonoma Valley winery, with one of the friendliest tasting rooms in the area, and the wines are excellent. I particularly recommend the Rhone-style whites (Rousanne and Marsanne), the single-vineyard Cabernet wines, and the Victory bottling (exceptional years only). Related bird watching spots: The closest birding spots to the south are at Hudeman Slough, Skagg’s Island Rd., Reclamation Rd. and Port Sonoma. See relevant pages for details. Shollenberger Park is in Petaluma. Adjacent to Shollenberger Park is Ellis Creek Water Recycling Facility. On the opposite side of Shollenberger Park from Ellis Creek Water Recycling Facility is Alman Marsh. See the pages for Shollenberger Park and Ellis Creek Water Recycling Facility for details. 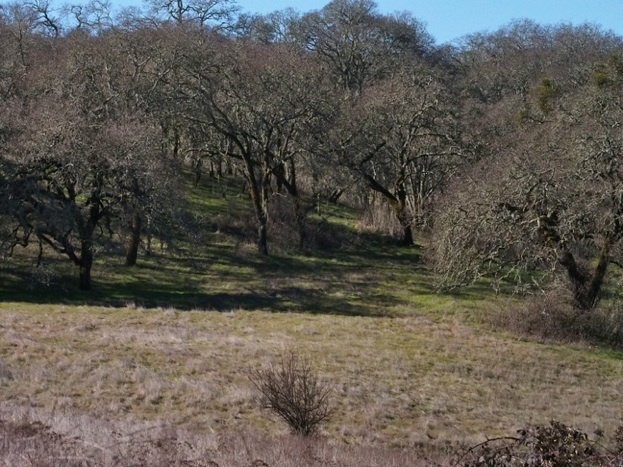 Also convenient, especially if you’re coming or going through Kenwood to the Santa Rosa area, is Sugarloaf Ridge State Park, as well as Hood Mountain Regional Park. For Santa Rosa areas bird watching spots, see the front page. Further afield: To the south is the San Pablo Bay National Wildlife Refuge (mostly in Solano County), but I've never been able to figure out how you actually get to the Refuge. To the west, you can head back to Highway 101 or Lakeville Hwy. The Atherton Rd. exit from Hwy. 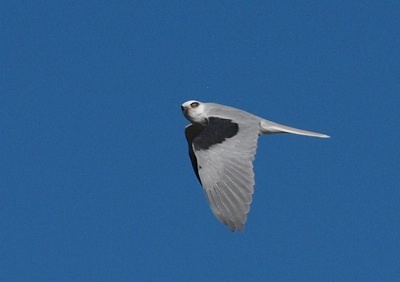 101 gives access to good birding at wetlands accessible from Bahia Dr. (Marin County). Head for the intersection of Bahia Dr. and Topaz Dr. A GPS address of 500 Bahia Dr., Novato, CA should get you close. 1600 Armstrong Ave. should take you close to good birding along Binford Rd., on the other side of the same area (heading toward Gnoss Field, a small airport here). Trails connect the two areas.